Pondicherry is also called as Puducherry. It is the Union Territory of India. Pondicherry is situated in the southeast coastal region of the Indian Peninsula. It is well-known as homes of various institutions/universities which imparts education in the field of engineering. Puducherry is bounded by the East Side Bay of Bengal & southeastern Tamil Nadu. The average literacy rate of Pondicherry is 85.85%. 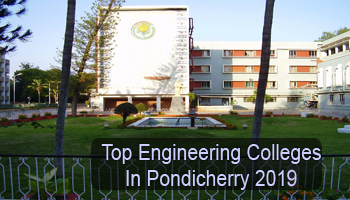 Candidates can check this article to know about the list of Top Engineering Colleges in Pondicherry 2019. Here, we have listed all the top engineering colleges in Pondicherry which helps students to select the best college. The given list is comprised of NIT, governments, self-financed & private colleges/institutions. Some of the famous institutions are National Institute of Technology, Pondicherry Engineering College, etc. Through a complete research & survey, we give the students list of best engineering colleges. We have rated these colleges on the basis of given parameters, i.e. accreditation & affiliations, building and infrastructure, national importance, faculty competence, placement statistics, quality education, student’s preferences, etc. Students will have to appear for the JEE Main examination to get admission into B.Tech & B.Arch courses. It is a national level entrance test managed by the NTA (National Testing Agency). The state authority will also conduct a state level admission procedure for admission to the engineering courses, i.e. CENTAC. Some universities also organize its own entrance test to provide admission into B.Tech programme. On the basis of GATE score, students will get admission in the M.Tech course. The colleges/institutions located in Pondicherry offer many disciplines/specializations for engineering courses. The most sought specializations are Mechanical Engineering, Automobile Engineering, Chemical Engineering, Electronics & Communication Engineering, Electrical Engineering, Computer Science & Engineering, etc. If you have any other doubts about Top Engineering Colleges in Pondicherry 2019, you can leave your comments below in the comment box. Why Rajiv Gandhi Engineering College is not ranked ?